Thanks to the generous support of JP Mascaro & Sons and the Pioneer Crossing Landfill, WalkBikeBerks is able to host BUNCO for Bicycles! In addition the Gold Sponsor will receive two complimentary tickets to enjoy the evening of fun and food with us on July 30. Two Silver Sponsorship spaces are still available. To become a Silver Sponsor, contact 610-799-9702 today. Be listed on Blog and on the WalkBikeBerks website. Receive two complimentary tickets to the event. There is no limit to the number of Bronze Sponsors available. To secure your sponsorship position, call 610-779-9702 today. Listed on Blog and on the WalkBikeBerks website. Printed on the BUNCO for Bicycles! program. A donation of just $50.00 will sponsor a table for the event. There will be exactly 51 tables available for sponsorship. Your company logo, information, and message will be placed on the table as the centerpiece. Because this is a social / mixer game, guests will move from table to table during the evening -- increasing the number of players who will have access to your company information. Printed as In-Kind Donors on the BUNCO for Bicycles! program. Does the construction or renovation of the school follow best practices regarding energy efficiency, water efficiency, indoor air quality, daylighting, light pollution and earth-friendly construction techniques as set out in the LEED for Schools program? "The Smart Growth Schools website is designed to make it easier for people to understand how they can improve their communities and schools by considering issues that are oftentimes ignored in the school planning process. 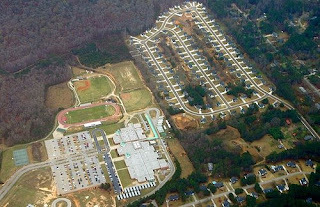 These issues pertain to the intersection between Smart Growth and K-12 schools. Paying attention to these issues will result in communities saving money, decreasing the environmental impact of schools on the community, improving the health of st udents, and increasing the long-term support for the school system by those who do not have school-aged children." Baldwin Wins WalkBikeBerks Bike To Work Incentive! 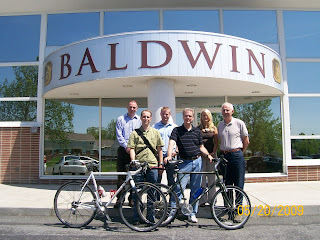 Congratulations to the Baldwin employees for having the most number of employees bike to work during the month of May! In total there were 6 employees who made a total of 86 trips and traveled 447 miles by bicycle from and to work during May. In total our entrance commuted by bicycle for a total of 189 trips and 1,460 miles! A raffle was held at Baldwin to select the winner for the $200 gift certificate to a bicycle at Spokes Bike Shop. Stay tuned to see who the winner is! Join us and the other winners at Spokes Bike Shop on Friday July 3rd at 6:00p.m. as we present the winners with their prizes! Our BCTV Program will air June 22 with the the title "Make It Intermodal." Become a Program Underwriter for BCTV -- our local public television station. The train ride was fantastic! No potty breaks, no gas stations, no hotel 1/2 way through the route -- dinner and breakfast included with the train ticket! The kids played outside in a gated park setting while we waited to board the train -- and slept through the night while we traveled! Travel was good. The destination -- even better. Check out Tradition, FL in Port St Lucie -- and maybe take moment to visit the new HGTV Green Home/ Dream Home. "We designed the community with sustainability in mind. People can walk or bike anywhere." Our family beach vacation is taking us to St. Port Lucie, Florida -- a long trip from Berks County, PA. Frustrated by airline service, long lines, and other travel nonsense when we fly -- my husband and I decided to take an adventure on the train! Our four-year old son is train-crazy and we've decided to make our travel option part of our family vacation. I've found some travel tips to help prepare -- and thought they were good enough to share. On Car Free Friday -- consider other ways you might get where you're going this summer! This ever increasing air travel frustrations and higher fuel price, train travel may be the alternative travelers are looking for. Trains offer a relaxed vacation environment and add the romance of traveling by train. The editors of IgoUgo, one of the most popular online travel communities in the world, believe train travel may be the way to go for summer vacations. Tapping into its community of savvy travelers, IgoUgo’s editors have pulled together tips, advice and itineraries for travelers looking for something other than the traditional fly-in summer vacation. Train travel offers an alternative to the hassles of airline travel. The U.S. airline industry received the worst score ever recorded in the most recent Airline Quality Rating (AQR) study. In the same study, consumer complaints were up 60 percent over last year. Americans may be increasingly more open to the idea of train travel. In 2007, Amtrak reported more than 25.8 million passengers, representing the fifth straight year of record ridership. More than 70,000 people ride on an Amtrak train each day. IgoUgo believes in many cases, Amtrak is a convenient alternative — with intercity passenger rail services to more than 500 destinations in 46 states. To venture into the world of train travel, remember these helpful tips for planning, booking and taking a train travel vacation. Every year BikePGH joins bicycle advocates across the nation to promote and participate in Bike to Work Day. There is one problem…one day a year to celebrate and encourage biking to work is hardly enough. So BikePGH and our partners have decided to launch a city-wide initiative to encourage commuters to leave their cars at home at least once a week. We’re calling it Car Free Fridays - a day where the air is a little cleaner and the streets a little safer. A day each week we can all look forward to, not just to welcome the weekend, but to welcome the use of smart transportation. What’s a BikePool? It’s like car pooling, but on bikes! People who need to ride from one neighborhood to another on a daily basis, meet up at a specified location and ride into work together. It’s a great way to learn how to commute by bike, beat the traffic jams, park for free, and build community. New to Bike Commuting? This is a great way to “learn the ropes” and take a ride with experienced cyclists. Read our Bike to Work Guide to get started. Once you try it, we promise you’ll be hooked. Experienced Bike Commuter? Join the Bike Pool to help create safety in numbers and show someone else that it can be done. Riding with new cyclists is an effective way to get people to try it out and take their first ride. WalkBikeBerks will be offering a hosted bike ride or walk on the second and fourth Saturday of each month this summer. The first event takes place this Saturday. Description: This bike ride will follow the Schuylkill River Trail to the Brentwood Trailhead, then return to Gibraltar. Prior to the ride there will be a short discussion on basic bicycle safety practices and trail riding etiquette. This ride is suitable for families. Please note that helmets are required for all participants. Enjoy a nice day on the trail and even get some ice cream at the nearby Scoupe DeVille in Gibralter or one of the many local eateries off of Brentwood. Please mark your calendars and call your friends! Reservations can be made for single players or entire BUNCO teams -- so plan to attend! We're teaming up with Breast Cancer Fight Club - a local Susan G. Komen 3-Day Walk Team. Opportunities to volunteer, donate, or sponsor the event are available now. Call 610-779-9702 or visit the Bunco for Bicycles blog for more information. Keep checking back for more details as they become available. Complete Streets in Philadelphia, PA! [Andy Clark] also presented Mayor Nutter with the League of American Bicyclists’ Bicycle Friendly Community Award. The City is the first in Pennsylvania to receive the honor, making yesterday’s event a particularly important landmark in moving toward a more livable Philadelphia. Compact, walkable communities—the opposite of poorly planned sprawl—are the solution to some of our biggest shared challenges, from childhood obesity to social isolation, from crash deaths to disappearing farmland, from the high price of gas to the architectural blight of strip development. Visit WalkScore.com to read more. Alliance Grants $125,000 to Organizations Visit Link WASHINGTON, D.C. (BRAIN)—The Alliance for Biking & Walking is awarding seven grants totaling more than $125,000 to grassroots biking and walking advocacy organizations. The Advocacy Advance Grants will be used to jump-start emerging advocacy organizations and to fund innovative campaigns with the potential to dramatically increase biking and walking. These grants are a key part of the Advocacy Advance Partnership with the League of American Bicyclists. Launched this year, the grants are made possible with generous funding by SRAM, Planet Bike, Bikes Belong and Cannondale. Nearly 100 proposals totaling more than $2 million were received in this first round. Awards include: Pennsylvania Walks and Bikes Pennsylvania Walks and Bikes will put a $30,000 matching grant to work to help build the first statewide coalition for biking and walking in Pennsylvania. The coalition will work to ensure state bicycle and pedestrian laws, policies, and funding are enacted. PA Bikes and Walks was founded in 2009 to create healthy, sustainable communities across Pennsylvania by making bicycling and walking safer, more convenient and more enjoyable. Motor vehicle crashes are the leading cause of death among children in the United States, but many of these deaths can be prevented. 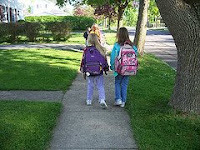 Safe Routes to School: The federal Safe Routes to School (SRTS) program provides children the opportunity to safely walk or bicycle to school, while also benefiting others interested in walking or biking and the community at large. Please encourage your U.S. senator to co-sponsor a SRTS reauthorization bill now. As the nation's reliance on cars for daily transportation grows, research on the subject suggests such dependence on vehicles may have a negative impact on the health of the general public, Reuters reports. According to a professor at the University of Colorado, although people should ideally take 10,000 steps per day to maintain optimal health, individuals who rely heavily on cars for transportation typically take just 1,000 steps daily. Meanwhile, researchers from the University of British Columbia in Canada quantified the link between distance driven and body weight, finding that an individual's obesity risk increases 3 percent for every 30 minutes spent in a car each day. By contrast, residents of neighborhoods with shops and businesses located within walking distance are 7 percent less likely to be obese than individuals who live in less walkable areas. In an effort to address such concerns, some community planners are exploring the possibility of modeling new community designs after older cities, such as New York, Boston and Chicago, which have densely populated streets and ample access to public transportation. As part of the shift, community planners also are examining ways to increase access to sidewalks, bike paths and other activity areas. For example, in Atlanta, which is known for its sprawling suburbs that are most easily navigated by car, city officials are considering a tram line project that would connect the city center with parks, communities and businesses (Bigg, Reuters, 6/1/09). Erica Burrus - Journal Prince Charles Yakubu leads a small group of students in jumping across rocks in a stream at the Deer Lake area in Forest Park. The students, all members of the after-school bike club at Compton-Drew Investigative Learning Center Middle School, regularly explore nature during their rides. On a nice summer day, Thomas Nolan would look outside and say "Who cares? "His mother would tell him to go outdoors. He'd ignore her and sit in front of the television or play video games.For the 13-year-old North County boy, nature held no interest. "I'd be like 'This is a stupid plant. Who cares about it?'" he said. "'Stupid bug.' I'd step on it. "Thomas was not alone. Educators and conservationists across the nation have become aware of most children's lack of exposure to nature. They call it Nature Deficit Disorder. The term was coined by Richard Louv in his book "Last Child in the Woods. ""It goes back to the idea that we as a species have an innate need for nature," said Lydia Toth, senior manager for education at the Shaw Nature Reserve in Gray Summit.Toth has noticed children becoming more tentative about nature for the last several years. She also has witnessed the documented increase in childhood obesity, attention deficit disorders and hyperactivity.Conservationists additionally fear there will be no future stewards of wild lands and wildlife if today's children do not develop a love of nature. "When folks in my shoes retire, who's going to take over?" Toth asked.The problem lies in breaking the trend of people spending more time indoors and plugged in to television, computers and video games, said James H. Wilson, the E. Desmond Lee Professor of Experiential and Family Education at the University of Missouri-St. Louis.Conservation educators throughout the nation increased their efforts to impress upon school administrators and teachers the need for nature education. It's often hard to get teachers to buy into the idea that children need nature and incorporate it into the curriculum, Toth said. "The kids embrace it if they're given the opportunity, but if they don't have a teacher that gets it, they don't get outdoors," she said.The Green Center in University City has worked for years with the University City School District and the St. Louis Public Schools to bring elementary school and middle school students to its property, which includes 30 acres of woodland, prairie and wetlands. "It's so obvious that students aren't comfortable being outdoors; it's such a foreign environment to them," said Jan Oberkramer, education and volunteer manager at The Green Center. "(But) it doesn't take long for kids to become comfortable in it. "Wilson has worked for years with the Herbert Hoover and Mathews-Dickey boys and girls clubs, introducing children to hiking, fishing and exploring nature. Wilson, Toth and Oberkramer all said it's most important to give children unstructured time in nature, where they can do what interests them.To that end, Toth has taken the lead of a new coalition of 22 entities called the Gateway Children's Nature Connection. The coalition is developing a website geared to serve as a clearinghouse for information about nature activities and events happening in the region.Thomas, the boy who cared little about nature, now spends more time outdoors. He used to pass when offered the chance to go camping with his Boy Scout troop. Now he camps often.He had his mind changed this year after joining an after-school bike club at Compton-Drew Investigative Learning Center Middle School in St. Louis city, which he attends through the inter-district transfer agreement. He has lost 10 pounds biking through Forest Park and now appreciates the birds, bugs and foxes he sees outside. He describes a peaceful vista he encountered while biking on the Katy Trail. "It's actually a beautiful sight," Thomas said.Joe Torrisi, a community education specialist with the St. Louis Public Schools, helped start the club almost 10 years ago to combat childhood obesity. The club added nature education after a Katy Trail ride when Torrisi found a student crying because the wilderness scared her. Both a physical education teacher and a science teacher now ride with the club. "We're getting them outdoors breathing the fresh air, seeing nature and interacting with it, not just driving by it," Torrisi said. "That enriches the whole experience. "The science teacher, Donna Callahan, said her students at first groused about going outside, but now come back to her after a weekend and talk about what they discovered. "I saw this. I saw that," she said they tell her. "What is it? What is it? "This exposure of one group of children to nature can have ripple effects, as Torrisi has seen with the bike club. "Through the years, that gets passed on," he said. "Nature and the outdoor experience is what they verbally pass on to the next kids." All good things on the agenda in my local community tonight -- a pharmacy, elementary school, trees and walkways and trails. It's a meeting not to be missed. If you are an Exeter Township resident, I strongly encourage you to attend tonight's meeting. Arrive prior to 7:00 to be sure you have a chance to sign up for public comments -- and let our appointed planners know that you appreciate their support of safer, better transportation network in our neighborhoods.